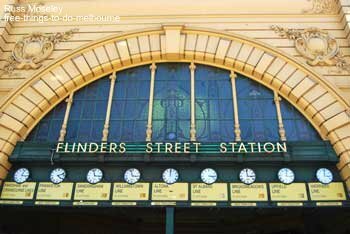 ........I met many times under the clock at Waterloo railway station in London but only recently found out that these clocks here in Melbourne are a famous meeting place too. I've read that a lot of the upper rooms in the station are not used and are in a poor state of repair. That's such a shame as it's a fabulous building and I've no doubt some of these rooms would have been magnificent once upon a time. .......There's a guided tour of the station which I must do one day. It's not free though. Check out where the station is in Melbourne by clicking on the blue writing underneath this map to make it larger. You can the make the streets bigger and smaller and move to the left/right and above/below by clicking on the +, - and arrow buttons on the top left hand side of the map.